Where Roots And Wings Entwine: Tots100 and Printerpix Photo Competition : Babies under 2 category. Tots100 and Printerpix Photo Competition : Babies under 2 category. Tots100 are hosting a competition with Printerpix to celebrate family photography giving bloggers the chance to win fantastic prizes. One lucky blogger with win a brand new Panasonic Lumix DMC-FZ200 bridge camera and memory card worth £500 plus a £100 to spend on the Printerpix website. There are also 4 runners-up prizes to be won, with a large framed photo or canvas print from Printerpix up for grabs. If you want to learn more or enter (but be quick as the time left to enter is fast approaching) take a look here. As I love taking photographs and constantly have our little old camera or the camera on my phone to hand to capture moments I could not resist entering this fabulous competition. I have always loved taking photographs and have so many photographs that are precious to me that I treasure. Since having little man my love of photography has flourished and love capturing memories and moments to do with little man. Even though I love my little camera and it has served me very well, it is starting to show signs of being abused used and the button to take pictures is getting slower and slower to responded and as such I miss many brilliant moments, ending up with photos seconds after a fantastic shot. Because I would love to give my camera a well-earned rest I could not resist entering this photo-tastic competition. A splishy splashy moment in time. 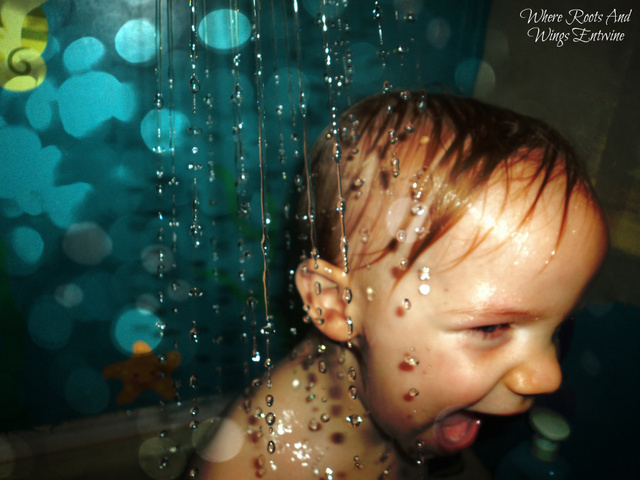 I adore this photo of my little water baby. Little man loves being in water, whether it be in the bath or the swimming pool (and I am sure when the weather gets better he will love being in the sea too). I have many photos of little man enjoying splishy splashy fun especially as little man loves living in the bath, spending ages in the bath and ending up like a very slippery seal when I attempt to get him out of the bath before he ends up looking like a shrivelled up prune. I captured this moment last month when little man was just over 21 months of age whilst he was having one of his marathon bath sessions. I love his expression and I am so pleased to have captured his shriek of delight as a shower of water was cascading onto him from one of his bath toys. I also love the glint from the droplets of water and the effect of disco lighting has had on the background. This is my entry for the babies under 2 category. This post is Elizabeth’s entry into the Printerpix Photo Competition. Oh that's a gorgeous picture!